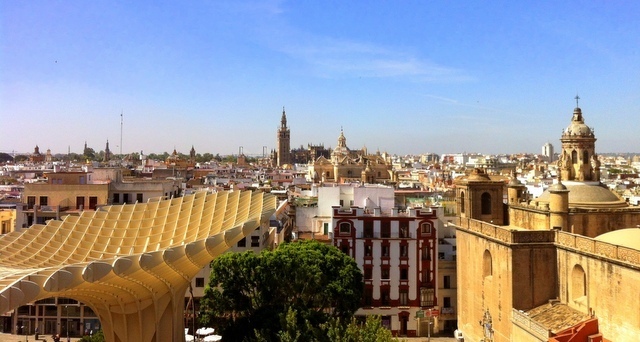 Most people who come to Seville for the sightseeing, and to absorb the unique atmosphere of the city have in mind its late mediaeval heritage sites, the Cathedral, the Reales Alcazares (Royal Palaces), and perhaps the Archivos de Indias. Throw in the Old Jewish quarter (Barrio Santa Cruz), Plaza España, and a quick visit to Triana across the river, and Bob’s your uncle – job done. Or at least, almost. 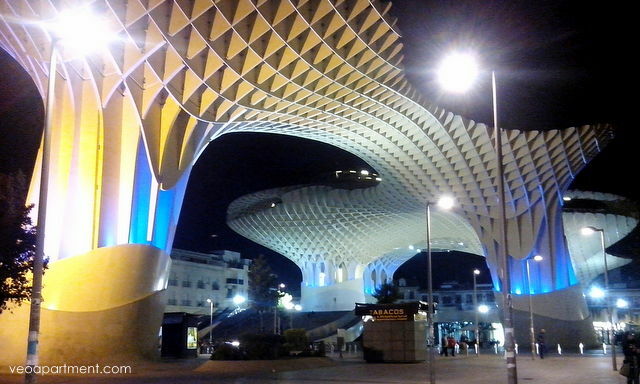 The Metropol Parasol, to give them their proper name (they’re also known as las Setas or the Mushrooms), are Seville’s contribution to modern, avant-garde architecture and can come as something of a surprise if you stumble upon them unexpectedly. 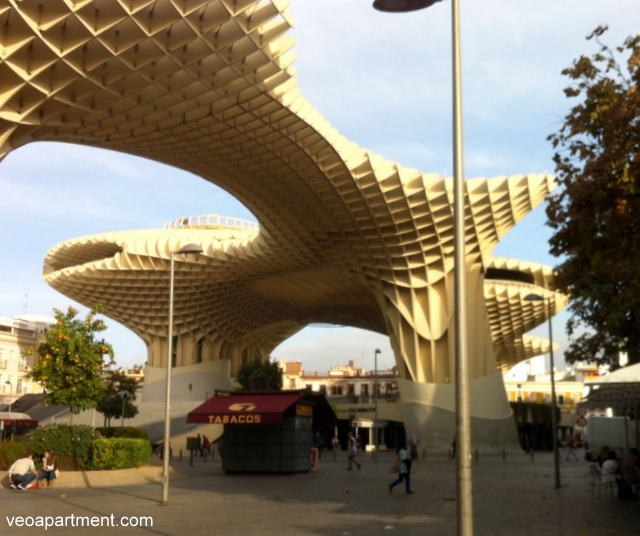 The swooping umbrella shaped lattice structure comprises six parasols, and rises about 26 metres above the ground, and is, in fact, the world’s largest wooden structure. It was designed by the German architect Jürgen Mayer-Hermann, who won the competition for a building to complete the redevelopment of the Plaza de la Encarnación, and after six years of work was completed in April 2011. The shape was said to have been inspired by the vaults of the cathedral roof, and by the giant fig trees in the nearby Plaza Cristo de Burgos. Predictably, the design, location, delays and cost overruns made it a controversial project, but now it’s completed its eyecatching shape and open spaces have helped to restore the economic and social life of the neighbourhood. Like the city itself, the site of the Metropol Parasols is something of a historical layer cake. The name of the square, Plaza de la Encarnación, derives from the Convent of the Incarnation, an order of Augustinian nuns, which was located here from 1591 until its demolition in the early 19th century (the order then moving to its present home in the Plaza del Triunfo). In about 1840 the city’s central provisions market was established here, continuing in operation until 1973, when the building, by then in a ruinous state, was demolished as part of an urban renewal project. The stallholders were moved to “temporary” accommodation in the northeast corner of the square, where they were to languish for the next 37 years. 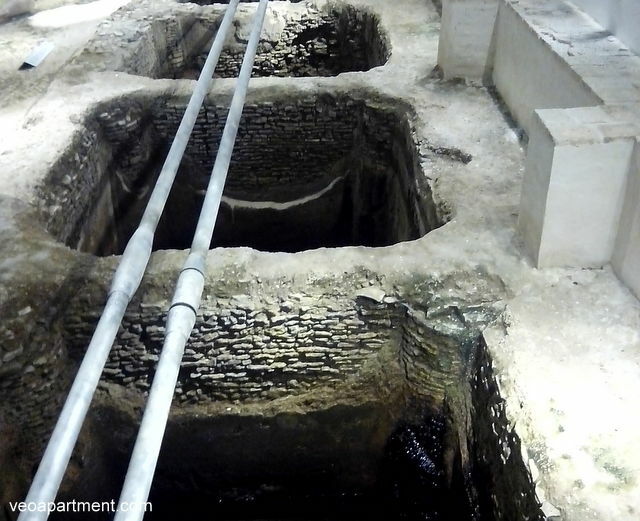 The site of the original market was left abandoned until 1990, when work on the construction of underground parking for a new market began, only to be halted shortly afterwards by the discovery of Roman ruins beneath. These can now be seen in the Antiquarium, the museum in the basement of the complex, and include a fish salting factory, esidential buildings and some well preserved mosaics. It’s well worth a visit, and is a nice contrast to the modern structure above. At ground level is the market, reinstalled in a modern market hall in its original location, and the main commercial hub of the neighbourhood. The roof of the market hall forms a plaza which holds various public events, such as small concerts and the christmas fair. From the basement take a lift up to the bar and walkways on the top of the structure for great views across the city. 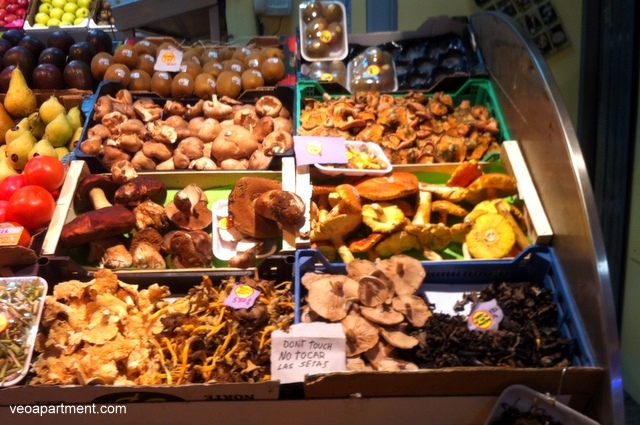 Almost next door, our holiday apartments in Calle Laraña have views of the Mushrooms and are within easy walking distance of other sights and facilities.